We were fortunate to get this original wild goose plum seed from a noted plum expert in Virginia. The story about this tree comes from a hunter who found the seed in the crop of a goose and planted it. Since then many seedlings from this tree were distributed under the name ‘wild goose’. To germinate the seeds: Plant outside in the fall 1/2 inch deep with seeds spaced 1 inch apart. Some seeds will germinate the first spring. 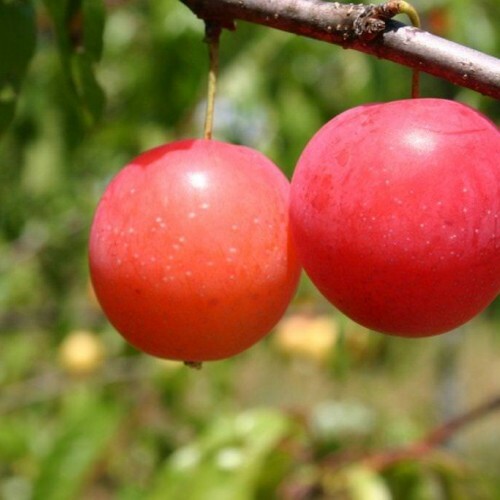 Keep in mind with the wild goose plum a portion of the seeds will germinate the second spring. For the refrigerator method, put your seeds in a zip lock bag with lightly moist Canadian peat moss for 60-120 days at 33-38 F. Never freeze plum seeds. Seeds will begin germinating in 60-90 days and the seeds will crack open. Take these out and plant in pots that contain well aerated sandy or perlite rich soil mix. Avoid using heavy compost as the roots rot easily. A portion of the seeds will need an additional warm (120 plus days room temperature) and cold stratification (as above) to break dormancy so do not throw your seeds out thinking they are bad. 2nd Dormancy -- 2D 25 SEEDS OFFER Cleaned seed going through a second dormancy. This means the tree percentage is very close to 100 percent after going through the cold stratification. . Seeds are stratified once and those that do not germinate the first season then are put into another warm period. All you have to do is give them light moisture and cold again. Yes---- these are floated to remove the empties. There are no blanks! Choose the 25 Seed offer to get the most from your efforts. Note on International: Some Prunus species are not allowed depending on the country. Self fertile but 2-3 plants ideal for production. Best in sandy loam or loam soil. OK in clay.